Beautiful Town house with great view. Message us for special rates. 5 Bedroom, sleeps 13, 2 1/2 bath, newly remodeled. Step into your home away from home. You will be greeted with beautiful hickory floors and an open floor plan. Enjoy the family room and kitchen that lead to a deck with a beautiful, unobstructed view of the mountainside complete with seating for dining and a grill. Enjoy a meal, a game a movie or some good conversation around the stone fireplace and large screen TV. The first floor also houses a set of bunk beds (full on the bottom, twin on the top) a comfy reading recliner and a full bath. On the second floor you will enjoy a master bedroom (Queen) with full bath and TV. Two additional queen size tastefully decorated bedrooms with plenty of closet space and beautiful views are available for your guests. Everyone should head down to the game/bunk room. This multipurpose room sleeps four (2 sets of twin bunks) has a large TV, couch, love seat, bar, half bath and a porch swing on the patio to enjoy the view or catch a moment alone. A fully equipped kitchen and upscale linens are provided. Deck of main level with seating and gas grill. Rustic get away with great views! Fantastic views! Fully updated and equipped. Beautiful view of state forest. 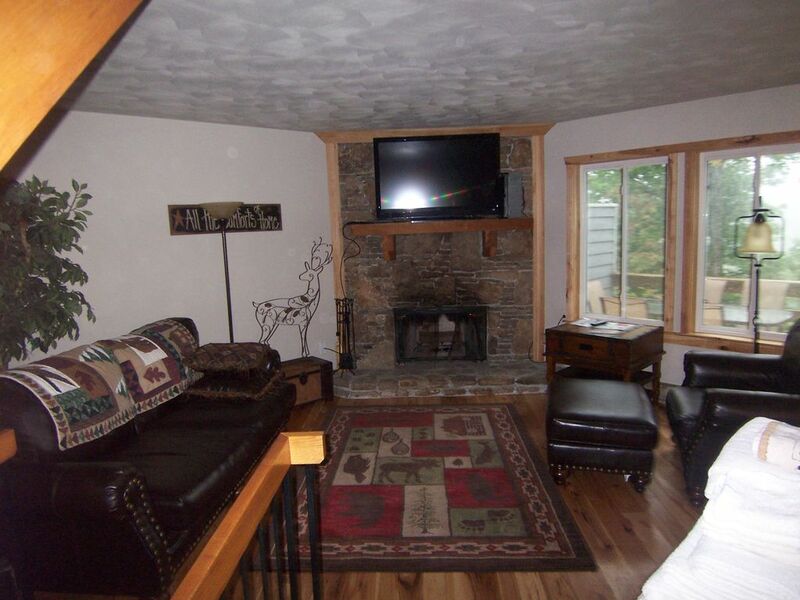 Large screen TV, Stone fireplace, beautiful views. Rear deck overlooks state forest...Beautiful view! The property overlooks a valley with nice sunset views from the deck. The really nice bonus for a larger group is the tri level layout with one bedroom on each of the main and lower floors and three bedrooms on the upper floor. Remodeling provides nice touches in the kitchen which is well equipped. The owners of this property were wonderful to deal with. This property is very nicely updated. It is cozy and very welcoming. My family and I had a great time at Hidden Valley and are excited to do this again. I highly recommend this owner and property. The owners of this property were fantastic. They were extremely responsive and took all measures to make sure we had everything we needed for our family trip. The property itself has a great floor plan with plenty of space. The kids loved the bunk room on the bottom floor. We would definitely rent this place again.